Automatic Dryness Control uses temperature sensors to end the cycle at the right time to help prevent over-drying. When you can’t fold right away use the Wrinkle Prevent Option. It tumbles clothes intermittently without heat to help prevent creases and crinkles from settling in. With 11 dryer cycles to choose from you can provide the optimal environment for drying all your clothes. Use only the energy you need with this gas dryer. Equipped with Automatic Dryness Control, it uses sensors that stop the cycle when clothes are dry to help prevent over drying. Generous 6.5 cu. ft. capacity means there's plenty of room to dry your loads. When you can't unload right away, the Wrinkle Prevent option will intermittently tumble your clothes to help prevent wrinkles from settling in. And drying clothes on your schedule is easy thanks to Timed Dry cycles. Yes, for a small charge of $15. Is there a propane conversion kit available? Amana 6.5 cu. ft. 120-Volt White Gas Vented Dryer The Question Is there a propane conversion kit available? does it have a buzzer to indicate cycle is complete? Yes, there is an audible sound when the cycle is complete. 6.5 cu. 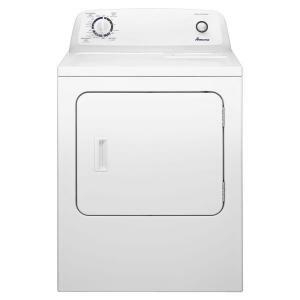 ft. 120-Volt White Gas Vented Dryer is rated 4.4 out of 5 by 1466. Rated 4 out of 5 by deputy068 from We got this dryer to replace a Samsung electric dryer that failed 4 times in the last 5 years and... We got this dryer to replace a Samsung electric dryer that failed 4 times in the last 5 years and never really lived up to expectations (took 1 1/2 hours to dry a large load). We've had the dryer for about 2 weeks now and have used it several times. It works just as you would expect a dryer to work - it drys the cloths in a reasonable amount of time (large load is done in about 35 - 40 minutes). While this dryer was reasonable priced, the add-ons (new gas hose to connect the existing gas supply to the dryer, new semi-ridge exhaust duct and 3 year extended warranty and haul away of the Samsung plus the ever present sales tax) added over $200 to the cost. The sales folks were really helpful. It was delivered and installed by Home Depot but I just spent 2 hours redoing the exhaust duct connection to the outside vent, which separated after 2 weeks of use. Love the dryer - but the delivery/install was not really in keeping with Home Depot's reputation. Rated 4 out of 5 by Vin from Easy to install by yourself, you just need to remember the hose and fitting, and the pipe dope f... Easy to install by yourself, you just need to remember the hose and fitting, and the pipe dope for gas dryers. Using it in a rental, works well, no complaints. Delivered to upstairs unit along with the washer without issue. Rated 5 out of 5 by Nancy from This model is simple to use, it dries well, and... This model is simple to use, it dries well, and is a little more quiet running than my 21 year old Amana model. Rated 5 out of 5 by HomeDepotCustomer from excellent drying time. Worked well in a limited space.... excellent drying time. Worked well in a limited space. Rated 5 out of 5 by LakeLivin from The dryer was delivered and set up. They took the old one. The dryer has worked great. When I ord... The dryer was delivered and set up. They took the old one. The dryer has worked great. When I ordered the dryer delivered they did not tell us that they would not install the vent because the opening was too small for the vent they bought, so we had to do that ourselves. They also moved the platform the dryer was on up against the wall, so the dryer was not level and we had to do after they left. We paid $78 for installation and could have saved that money because all they did was connect the gas to the dryer. Just be aware that they do not install vents for the dryer, at least that's what we were told. 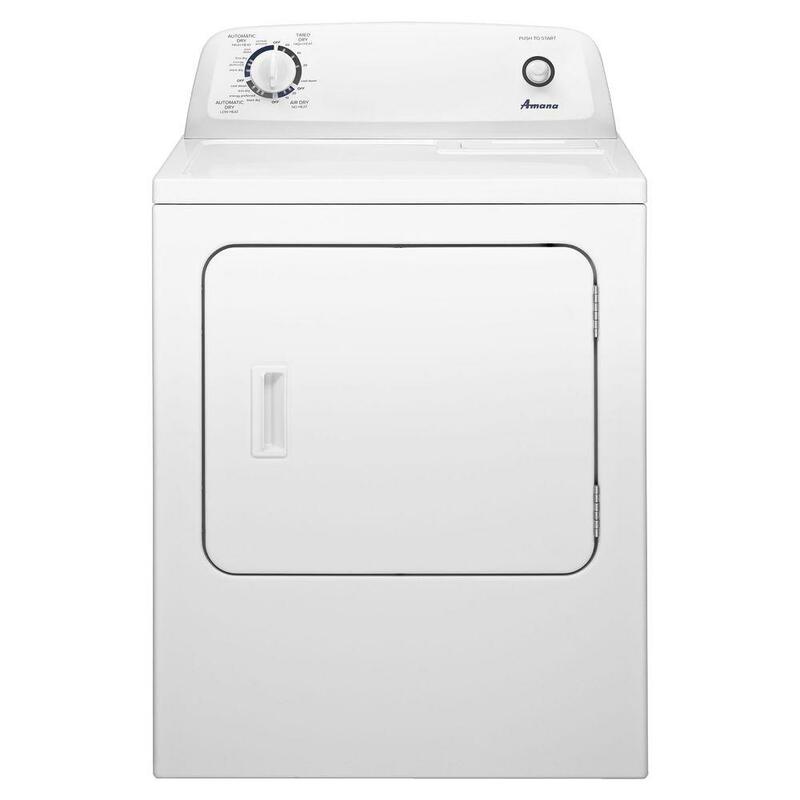 We have had the dryer now for over a month and had no problems with it and would recommend it for anyone needing a gas dryer at a somewhat reasonable price.